Shiela entered our Home at Last Program in 2013, after being homeless for four years. Before that, Shiela went back to school to become certified as a forklift operator and was still unable to find work due to being over or underqualified. At a time when she should have been preparing for her retirement, Shiela faced homelessness. Shiela was connected to Volunteers of America (VOA) and was given the phone number to Next Move Homeless Services. From there she was connected to our Home at Last program and approved to move into the program’s apartments. 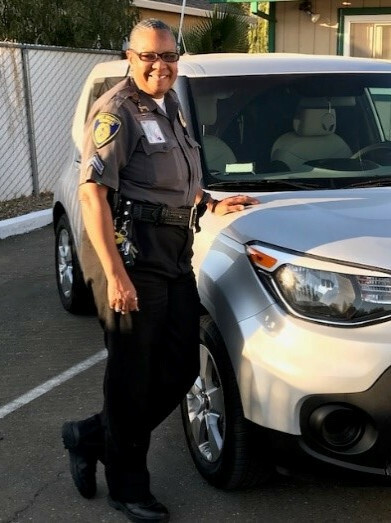 After participating in Next Move services and receiving support from her Case Manager for two years, Shiela was hired as an entry level security guard. She is now a Corporal at her company and has five sites where she supervises security staff. Shiela is currently working on getting her finances under control and achieving her life goals. She now owns her own 2019 vehicle that she has named “Toaster on Wheels.” Shiela’s future goals are to continue to be in the work force and be active in her life. She hopes to someday purchase her own home. Congratulations Shiela on all your accomplishments!